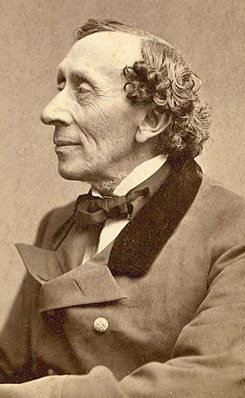 The big bronze statue of Hans Christian Andersen was made in 1888. The statue can be found in the Fairy Tale Garden near Skt. Knuds Cathedral, but was originally placed in The Kings Garden and later it was moved to Gråbrødre Square. The artist behind the statue is Louis Hasselriis (1844-1912). The first draft for the statue was made in Rome in 1875, but changes were made so that Andersen’s coat now hangs from one of his shoulders. The statue is owned by Odense’s Arts Fund.